Vampire Academy was surprisingly entertaining. I went into it not knowing what to expect, other than the fact that a well-respected reader-friend-teen of mine really loves it, and I ended up reading it very quickly and really liking the whole thing. What I liked the most: Rose as a real, likable girl. Rose Hathaway is one of the best protagonists I've ever met. She carries the book on her stubborn shoulders, and I wouldn't have it any other way. Rose is complex, nuanced, and changes appropriately over the course of the story. She reacts in ways that are consistent to her character, her feelings for Lissa never waver, while her feelings towards other characters shift and develop as her relationship with them changes. Rose is funny, endearing, and strong. She is the reason I want to keep reading Vampire Academy books. What I liked the least: The action scenes near the end of the book. The fight between Rose and the other Guardians and the creepy spirit wolf things was a little bland, not very tense, and left me kind of confused afterwards. The story really isn't action-packed, so I can see how the biggest fight scene in the book wouldn't be very strong, and it wasn't that bad, but I'm hoping the rest of the books develop the action scenes better. Overall I really enjoyed the first book in the Vampire Academy series and would highly recommend it to readers looking for a fun, dramatic paranormal story. Vampire Academy was an amazing book. I liked how there isn't just one type of Vampire. There are the Strigoi, Moroi, and Dhampir. Rose and Lissa were friends ever since they were in kindergarten. They left the Academy for two years for reasons that no one knew but them. When they are forced to come back to the Academy things get way more complicated for them. I liked the friendship between both Rose and Lissa and how they would do anything for each other. I don't think that I have a favorite character so far for this book. It is a very hard decision. I Love Christian , Lissa, Dimitri, and Rose they are all amazing characters with different personality and depth. Vampire Academy is defiantly one of my favorite books now. I love it and I want to read to rest of the books in this series. Well, I finally did it. I finally read Vampire Academy! The series has been out since 2007 and hoards of adoring fans rave about it, but I just never got around to reading it. So, when I saw a super cheap copy of the first book at my local used book store I decided to pick it up. I'm so happy I did! This is really a different kind of vampire book and the characters are honest and refreshing. The story is mysterious and captivating while still being fun. I can't say I loved everything about it but I still think Mead is deserving of all the praise she has received, at least based on the first book. Rose and Lissa. The friendship that these two share is really incredible. Rose is headstrong and wild and fiercely protective of her best friend, the sweet, unstable Lissa. Lissa, in turn, trusts and respects Rose, despite her lower social status and questionable reputation. There were definitely times where I forgot that this book was about Vampires at all because Rose and Lissa's friendship was so commanding. Lissa is intensely vulnerable after the deaths of her parents and brother. Although she is a royal Moroi vampire, she has few real friends at school but Rose makes up for this completely. Rose, in addition to being her best friend, is also her guardian and has devoted her life to protecting Lissa. However, Rose does not act out of duty but rather out of love and loyalty. There's really nothing like a best friend, even if you're a vampire. The Vampires. I was really expecting the vampires in this book to be tough, powerful, bloodthirsty immortals - you know, vampires. I'm usually a purist when it comes to these sorts of things, but Mead really put the humanity back into these guys. At least, some of them. There are two types of vampires, Strigoi and Moroi. Strigoi are more like the classic vampire: undead, ruthless, soulless monsters. Moroi, though, are alive and connected to the earth. And while they are strong and need blood to survive, they also need regular food and sleep and protection. They are hunted by the Strigoi and they need half-vamps to protect them. Their vulnerability makes them relate-able and easy to understand. It also makes it necessary for them to bond with their protectors. I just really liked they weren't huge bad-asses. And that surprised me. It doesn't feel like an intro. Finally, I like that this book doesn't feel like it's just here to set up the rest of the series. There are so many first books that do this and it is one of my pet peeves. Vampire Academy could almost be a stand-alone novel. It isn't a cop-out. Adult Themes. First, let me say that I don't have problems with adult themes in YA books, as long as they are dealt with tastefully and responsibly. Part of being a teenager is learning how to deal with "adult" things so I see no problem with putting them in YA literature. There were a couple of things about this book that bothered me. First of all, the language was a little iffy. I was sort of surprised by the amount of cursing throughout the book. I am no prude when it comes to language, but I thought Mead went overboard sometimes. Second, self-mutilation is a huge issue in this book. This is something that real teenagers sometimes have to deal with, whether it be with their friends or themselves, but I think it was handled a bit too lightly in some place. For instance Rose refers to Lissa's cutting as "her weird way of coping" at one point. I think that's a bit flippant, personally. To be fair, this issue is dealt with on a more responsible level later on, but it still bothered me. Lots of dead/mutilated animals. This sort of goes hand-in-hand with my first problem. The shear amount of animal mutilation in this book is a little startling. I get it, it's a book about vampires, who cares if a bunny gets ripped apart when people are dropping like flies. But, it was just a little gratuitous. Pedo-alert? Okay, this one might make some of you angry because I know how much you all love Dimitri, but seriously, Rose is in high school! He's in his mid-twenties. I'm 25 and I would go to jail if I were involved with a high school-er. Plus, yuck. I know, he's super hot and moody and ripped, but couldn't they be a little closer in age. Maybe as the books go on this gets less creepy as Rose gets a little older. Here's hoping. 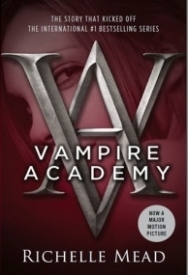 Overall, I really enjoyed Vampire Academy. I think it was just what I needed after a stressful couple of weeks. It has adventure, action, horror and romance. It's a great summer read and I can't wait to get my hands on the next one! I think Richelle Mead is an awesome author.I can not wait to review the others books of the series ,and first book of bloodlines. This characters especially the tough girl rose who is half - human and half- vampire who is a guardian for her best friend Lisa her is a Mori ,who is a vampire royalty.While they were living in the outside world the guardians from the vampire academy caught them and return them to the Vampire Academy.While they are there Rose must battle love and a evil person who wants to use Lisa special powers for his own use. This Book is so good that when you starts to read it's hard to stop. I have read this series more than 5 times. One of my favorite Books ever the characters are interesting and each character is unique. I absolutely loved this book! It has become one of my favorite YA series. Lots of drama, romance, and action to keep you interested! This is one of the few books I've read where most of the characters have a bog role to play. It does have it's main characters, but everyone has their story to tell. I think this book will definitely have its fans. The plot and the characters are interesting. The story as a whole fell a little short of what I wanted. I felt like the writing was "thin." I wanted more detail, a tighter storyline, and just ... more. But, I also enjoy thick books with lush prose and so keeping that in mind, I will say again that there's nothing wrong with this book and I'm sure it will have many fans. Really liked the way this book was written. Every main character (and a few side characters, too) had a huge influence in the story line of the book. Really thought the lore and the customs of the vampires in this book were well thought out and original which just deepens the story line. Overall the best book about vampires I've read so far (and I've read A TON of vampire books.) Totally recommend it to anyone who enjoys the young-adult fiction genre and the paranormal-romance genre. This book has MANY good points, but the most obvious one is that this book isn't like all the other cheesy vampire books. Right from the beginning you know this isn't some stupid vampire book rip-off.